Fifteen years is a long time. A very long time. I have my fifteenth wedding anniversary coming up this Friday and it’s made me realize how time has passed so quickly. Some days it seems like we just got started and other days I feel like my life with my husband started a lifetime ago. We were young and poor and super happy when we first got together. 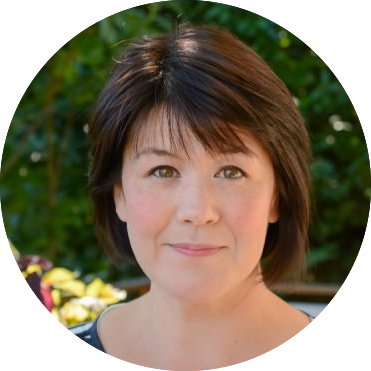 When my son was born we were living in a one bedroom, one bathroom apartment with two dogs, two cats and a mother-in-law on the couch. While I wouldn’t want to go back to living paycheck to paycheck there was something special about that time. I guess our life together still felt so undetermined and full of possibility. As I get older change seems less likely to happen but I know that you can never prepare for what life may bring you. I’m happy with my life and am so glad about all the changes we’ve made this year but I’m feeling a bit nostalgic about the early days of our relationship. When it was just the two of us in our little apartment by the beach and we had all the time in the world to worry about making grown-up decisions. Play came easier and free time was an expectation, not a luxury. It makes me realize that we really do need to make some time just to be the two of us occasionally. We are off to Spokane for the holiday weekend and we are going to be somewhat on our own. I’m hoping for a few date nights, where we dress up and set our cell phones and computers aside and focus on each other. The way we used to, back in the good old days. Mangos have been all over my local supermarkets the last few weeks and I couldn’t resist a huge sale. Once I got home I realized that I had six mangos and no idea what to do with them. 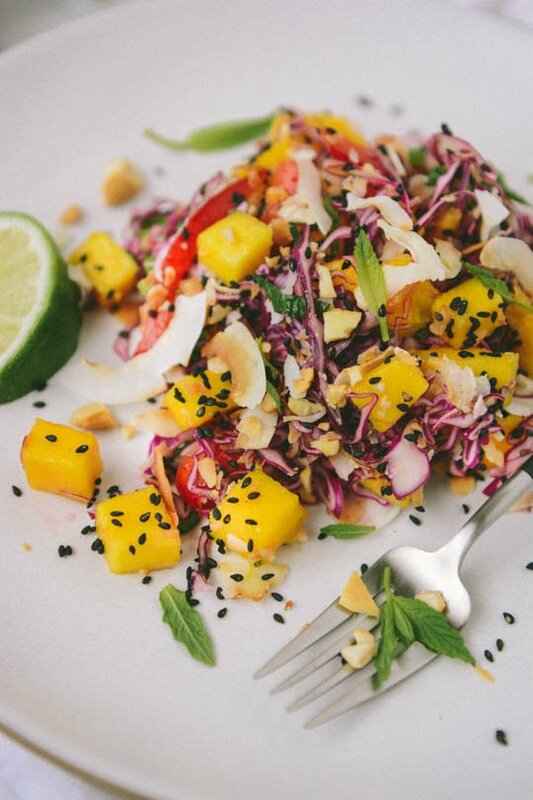 I started thinking about summer and tropical flavors and decided to make a light salad with them. 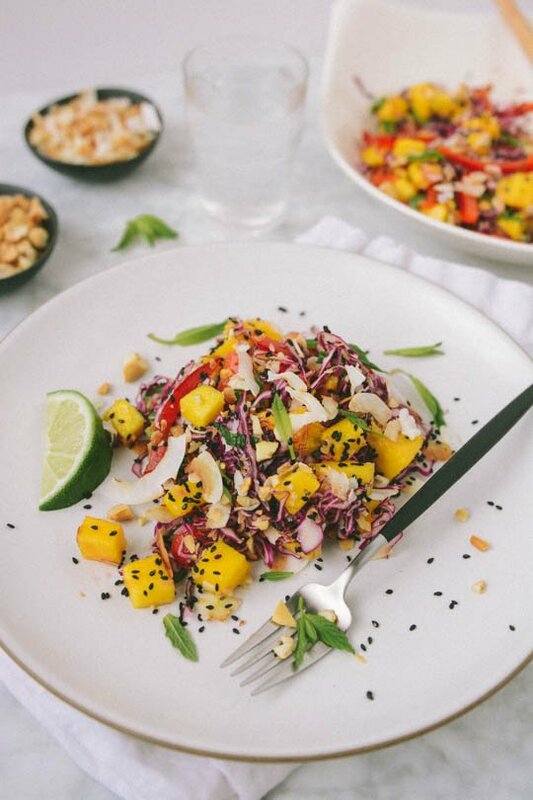 The dressing is a combination of fresh lime juice and honey and creates a nice sour sweet balance with the mangos. The fresh mint is critical to the salad, it adds a brightness and brings all the flavors together. For a more substantial version some chopped avocado would be a great addition or come poached chicken or shrimp would also be a great compliment. 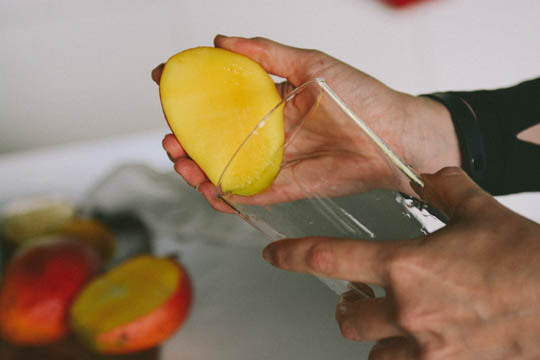 I’ve suggested that you peel the mango using the lip of a drinking glass. I came across the technique on Pinterest and can’t believe I never tried it before. One of the reasons I usually avoid mangos is how difficult they are to peel. It’s super easy and makes a lot less mess! You will still have to use a knife the peel the fruit around the seed but you should really give it a try! 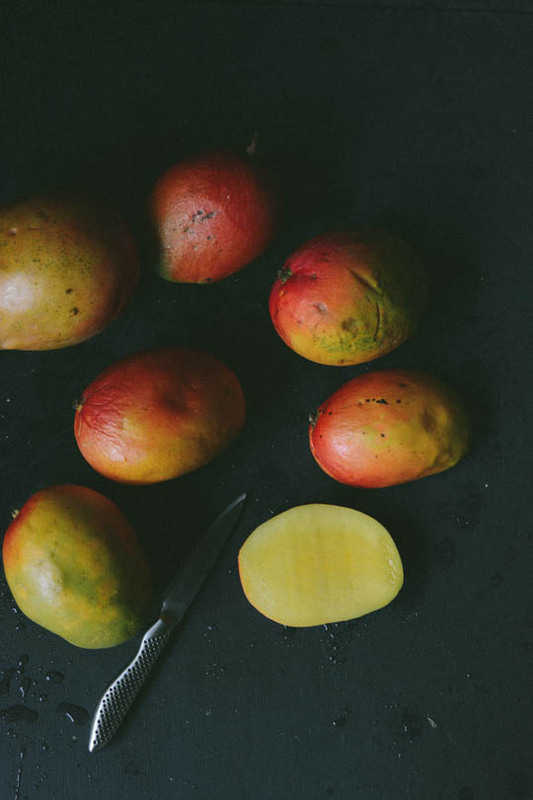 Slice the mango close from top to bottom close to the pit, yielding two slices. 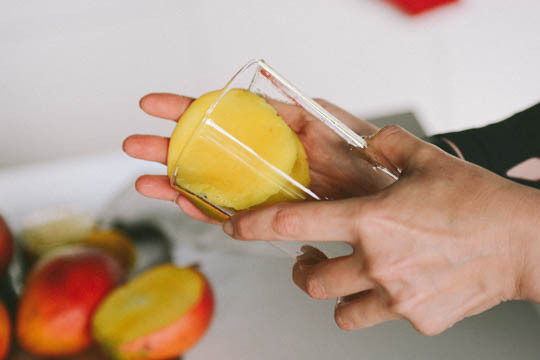 For a quick and easy way to peel the mango place the edge of a cut mango of the rim of a drinking glass and using a little pressure slide the mango down the side of the glass. 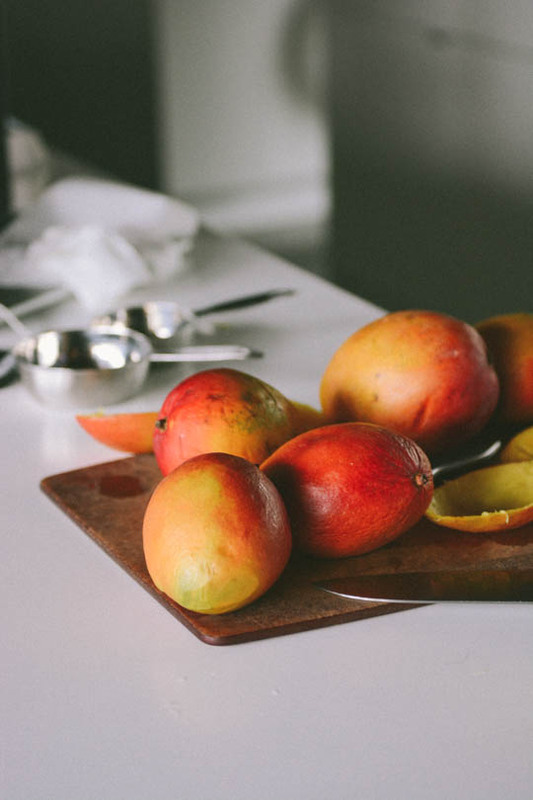 You should end with a nice piece of mango that you can slice into cubes. 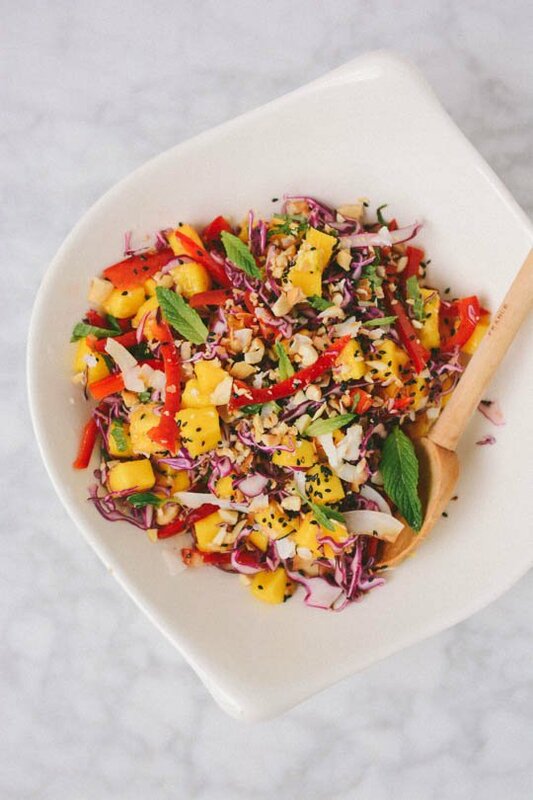 Toss the mango with the cabbage and red pepper in a large bowl. 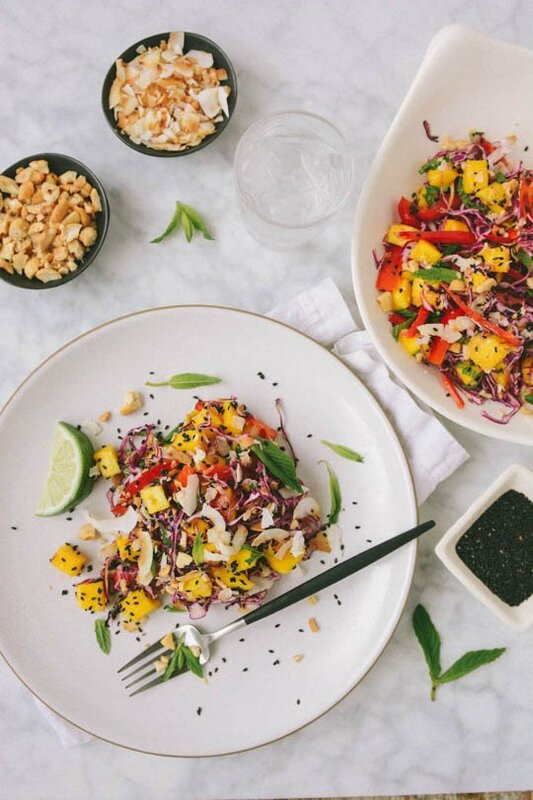 For the dressing combine the lime juice, rice vinegar, grated ginger, honey, salt and pepper in a small bowl. Pour the dressing over the mango mixture and toss to combine. At this point you can let the salad sit in the fridge for up to an hour to allow the flavors to meld. 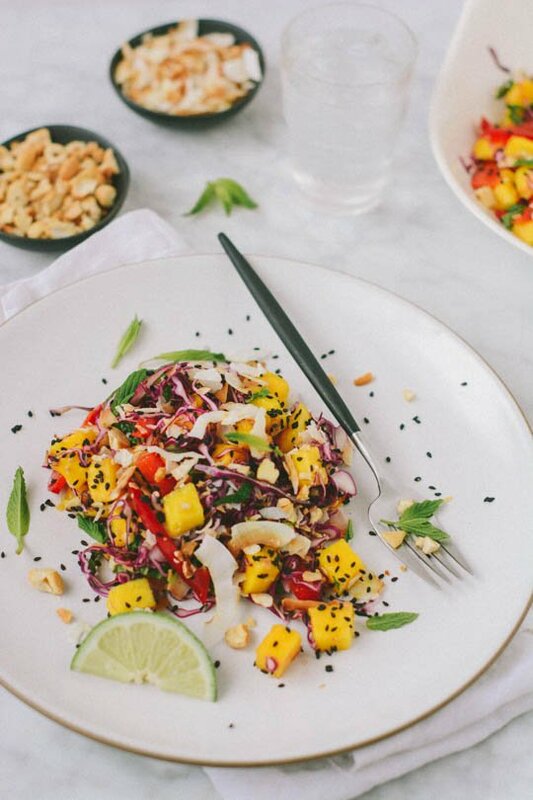 To serve sprinkle the salad with the coconut, sesame seeds, mint and cashews and toss lightly to combine. I went a little overboard when I saw mangos on sale but I am really glad it led me to creating this recipe. 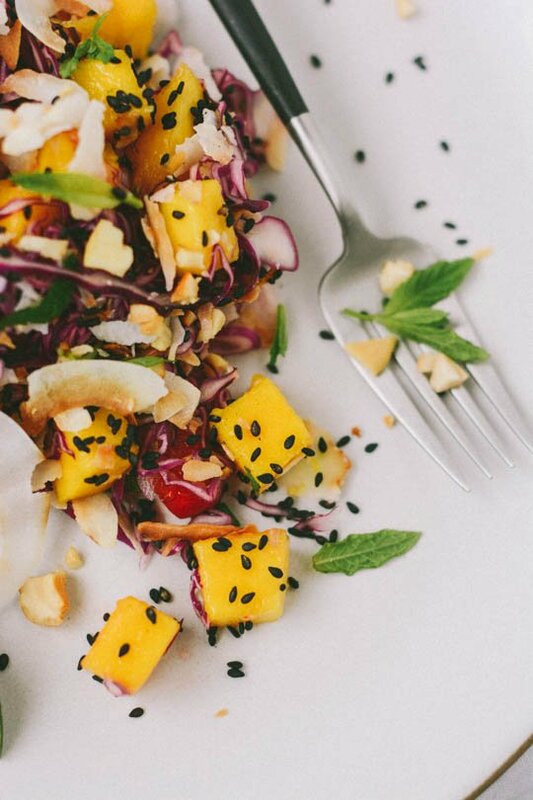 I love fruit in my salad and I haven’t really made one with mangos before! I have all these ingredients and plan to make this salad tomorrow. I’m wondering about the coconut oil. Is that added to the dressing? I can’t wait to try this recipe! Happy holiday weekend to you. Sorry about that. You should actually use a neutral oil that is liquid at room temperature such as canola, or extra-virgin olive oil. I wanted to try to enhance the flavor of coconut but it isn’t a good choice for salad dressing. I forgot to amend the recipe to reflect that. It’s been corrected now. I hope you enjoy the salad if you try it! Thank you for the mango peeling tip! Can’t wait to try it!